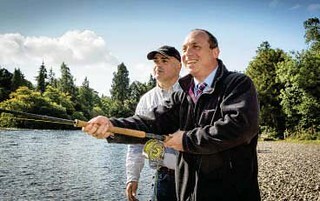 Roddy Henry, Deputy Principal of Inverness College UHI got some casting tips from Scott Mackenzie at the opening of Scotland's Salmon Festival 2017. Speaking at the River Ness about the Festival, he said 'Our Rivers and Lochs Institute is at the forefront of research into freshwater biodiversity and in particular, the Atlantic salmon, and this is a great opportunity to share our work with the wider public.' The launch saw the opening of the two day Conference at Inverness College UHI, including an evening of public lectures. The Inverness Angling Club Centenary Speycasting Tournament, marking the Club's 100th anniversary, was also launched alongside the Bught Park Family Fair.